Harbhajan Singh smashed an attacking career-best eighth half-century as India posted an imposing first innings total of 487 and then snapped two early wickets to wrest initiative on the second day of the opening Test against New Zealand in Ahmedabad on Friday. The feisty off-spinner scored 69 in 97 balls with three sixes and five fours to help his team post 487 in their first innings after they were reeling at 412 for 8, post lunch at the Sardar Patel Stadium in Motera. Replying to India's first inning total, the Kiwis started on a shaky note as Zaheer dismissed inexperienced New Zealand batsmen Tim McIntosh and Ojha cleaned up B J Watling cheaply before McCullum and Taylor stemmed the rot. In the morning, New Zealand fought back gamely with a weakened attack that was without debutant pacer Hamish Bennett, who pulled out due to a groin strain, to dismiss three top Indian batsmen. 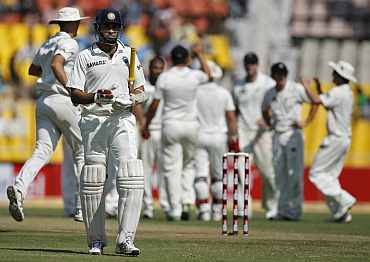 The hosts lost both the overnight batsmen in Sachin Tendulkar and V V S Laxman and then Suresh Raina as well in the pre-lunch session. Soon after lunch break, the Kiwis added the wickets of captain Mahendra Singh Dhoni and Zaheer Khan also to their kitty before Harbhajan, whose previous highest was 66 made against Zimbabwe in Bulawayo in 2001, led the late surge. The Kiwis sent back Tendulkar, Laxman and Raina in the last 25 minutes to dramatically change the complexion of the game. Raina and Laxman were dismissed at the same score of 392 in the space of four balls just before lunch by debutant Williamson and Patel. 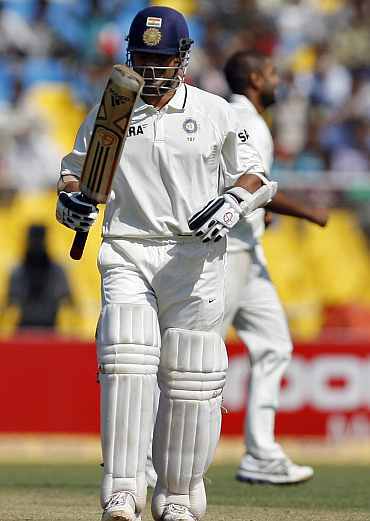 Tendulkar (40), Laxman (40), the two unbeaten overnight batsmen, were separated after a stand of 66 runs in 188 balls with Patel accounting for both of them in the last half hour before lunch. Raina (3) was sent back by part-time slow bowler and debutant Kane Williamson as India slipped from 383 for three to 392 for six in just six overs in the last half an hour of the first session. Patel, who looked hardly threatening yesterday, accepted a tame return catch from Tendulkar and then trapped Laxman in front with a spinning ball. Harbhajan, who came in at the fall of Laxman who fell in the last ball before lunch, found a good partner in Ojha and the duo pulled India past the 450-run mark. Harbhajan swung Patel to the long on fence for a four and a six before flat-batting Vettori for a six and hoisting him over long on to help the Indian total leap in front. The first hour after lunch brought in 49 runs in 17.4 overs before Harbhajan completed the eighth half century of his career, and second against the Kiwis, in 58 balls. It included four hits to the boundary and a couple of sixes. He then swung Patel over mid-wicket for a third six after raising the half-century partnership with Ojha in 81 balls. 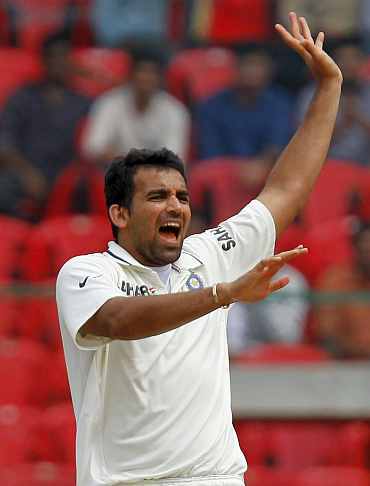 Indian pace and spin combo of Zaheer Khan and Pragyan Ojha then bowled superbly to snap two early wickets as New Zealand finished the day at 69 for two in 28 overs, still trailing by 418 runs with 8 wickets remaining. The Kiwis started on a shaky note as Zaheer dismissed inexperienced New Zealand batsmen Tim McIntosh and Ojha cleaned up BJ Watling cheaply before McCullum and Taylor stemmed the rot. McCullum two-hour vigil was embellished with seven fours, while Taylor had three boundaries in his 18-run innings.